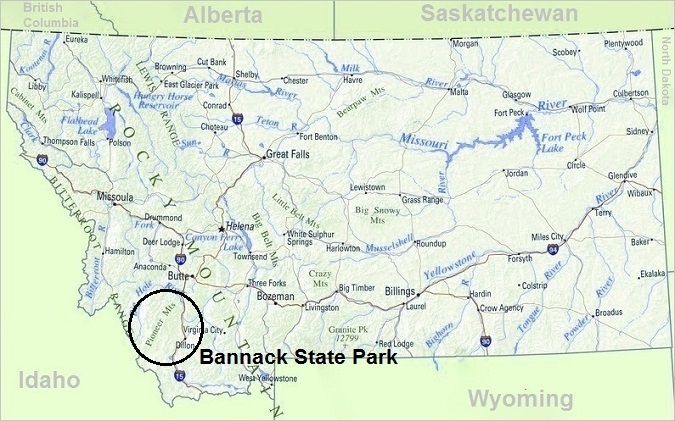 Montana, but Bannack is also the first Territorial Capital of Montana. Today over 60 original buildings line the main street of Bannack, and this remarkably preserved ghost town, along this its immeasurable historical significance, is truly one of our nation's treasured landmarks. 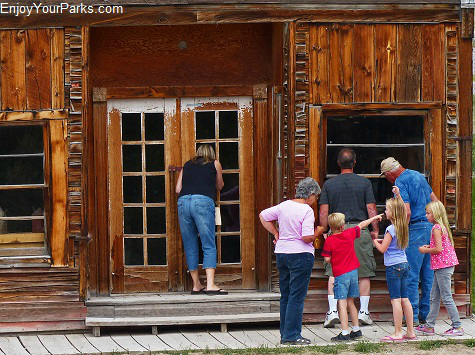 Without question Bannack State Park is undoubtedly a "Must See" while exploring the great state of Montana. On July 28, 1862, John White discovered gold on Grasshopper Creek in the southwest Montana, which marked the founding of Bannack Montana. 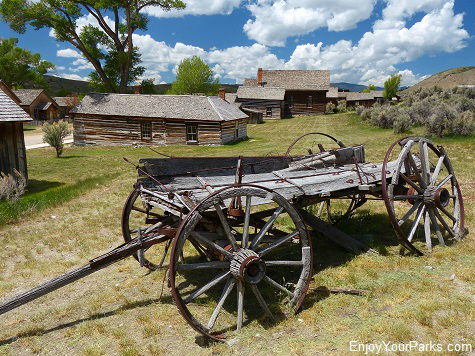 The discovery of gold near Bannack in 1862 was the beginning of the Montana Gold Rush Era. News spread fast, and thousands of prospectors and entrepreneurs rushed to the young mining town of Bannack Montana in hopes of striking it rich. In a very brief period of time, the population of Bannack exploded to over 3,000 people by 1863, and Bannack was named the first Territorial Capital of Montana on May 26, 1864. 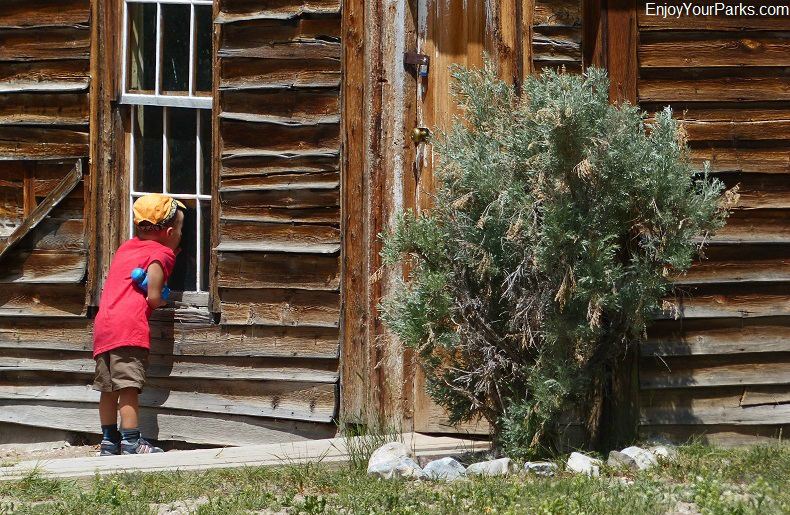 Visitors enjoying Bannack State Park, Montana. City then became literally overnight the next gold rush "boom town". Because of this shift in attention and population, the Territorial Capital was then moved from Bannack to Virginia City in 1865. However, some prospectors did choose to stay in Bannack, and from the 1860's to the 1930's, Bannack held on tight as a mining town with its population in constant flux. By 1950 the gold workings dramatically dropped off, and most people left the town of Bannack permanently. The State of Montana then stepped in and declared Bannack to be a State Park, and it was also designated as a National Historic Landmark. David's Pioneer Ancestors... They Were There! 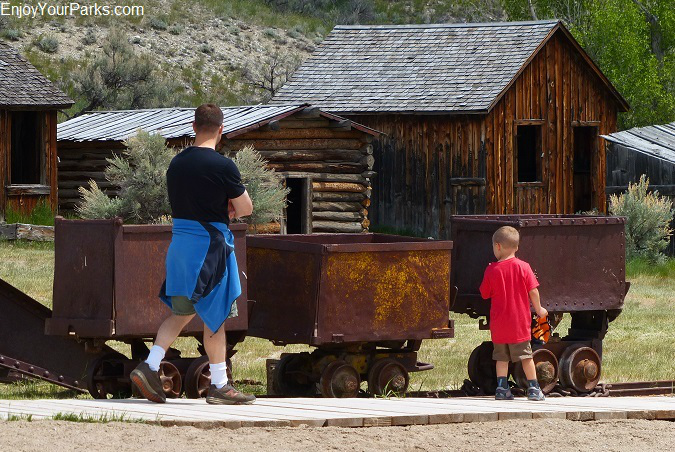 David's great, great, great grandparents came to the brand new mining town of Bannack, Montana in 1862, just 5 months after gold was first discovered here. Originally from Maine, William and Clara Dalton with their four children including 18 year old Matilda Dalton, were part of the First Fisk Expedition of 1862. Beginning in Minnesota, this harrowing wagon train expedition journeyed through the middle of the untamed wild west. Fortunately the Daltons survived this incredibly dangerous adventure, and eventually arrived in Bannack Montana on a cold December day in 1862... again, just 5 months after gold was first discovered there in Grasshopper Creek. One year later, in 1863 William and Clara Dalton packed up their four children and moved to Virginia City, as gold was discovered there just a few months earlier. With this discovery, Virginia City Montana became the next new gold rush town that everyone wanted to be a part of. 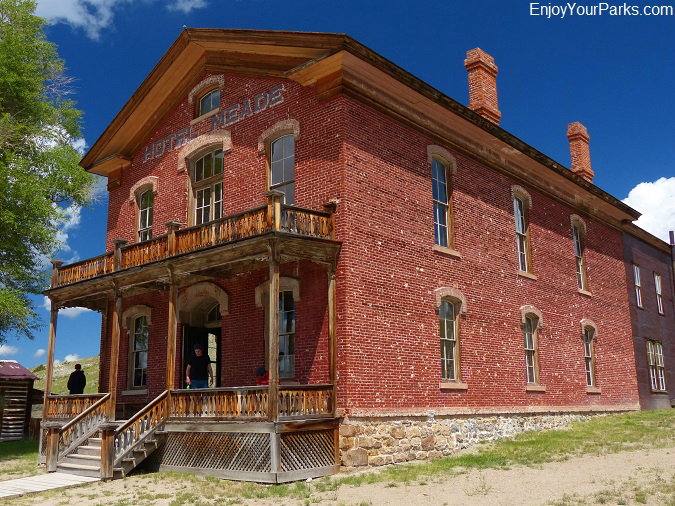 The Historic Hotel Meade in Bannack, Montana is known to be a very, very haunted establishment! respected man by the name of Henry Plummer to be their sheriff in 1863. Both Bannack and Virginia City were incredibly lawless during this early gold rush period, where robbery and murder were the two most common crimes. In 1863 an organized gang of road agents banded together and called themselves "The Innocents". This gang of notorious road agents robbed stage coaches traveling between Bannack and Virginia City, and were responsible for over 100 murders in the Virginia City/Bannack area. This criminal activity resulted in the organization of what was known as "The Vigilance Committee" in Virginia City. Also called "The Montana Vigilantes", this grass roots organization basically "cleaned house" in the Virginia City area, hanging well over 20 road agents in their first month (January 1863) in Virginia City and Bannack. One of these road agents was the well-respected Sheriff Henry Plummer, who was actually the secret leader of "The Innocents." Henry Plummer was hanged in Bannack in January of 1863, along with several of his gang members. It was well documented that Plummer was the only road agent hanged by the Vigilantes that cried and begged for his life. Shortly after the Montana Vigilantes hanged over 20 members of "The Innocents", any remaining road agents in the area fled with their lives, never to be seen or heard from again. 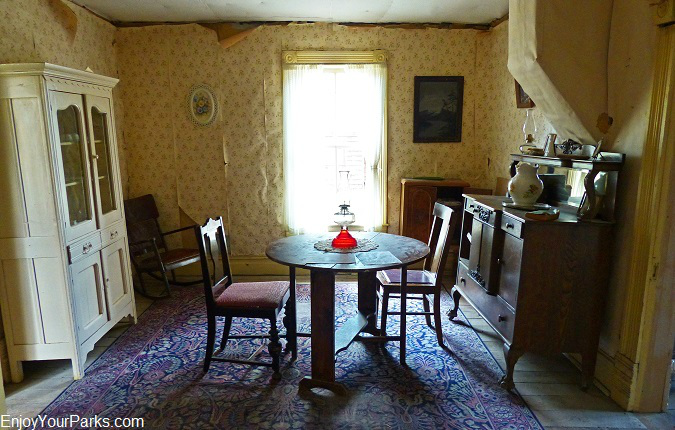 Inside one of the historic gold rush homes in Bannack Montana. Click Here for more information about the Montana Vigilantes and "The Innocents"
By the way, David's great great great grandparents William and Clara Dalton had a farm near Portage City Wisconsin around 1843. Ed and Rial Plummer and their children that included two girls Rosie and Parnelia, and their son Henry. The families lived near each other for nearly 8 years. Coincidentally, both families were originally from Maine. The families knew each other well while living near each other in Wisconsin. But when William crossed paths with Sheriff Henry Plummer on the main street of Bannack, Montana one fine day in early 1963, Plummer denied knowing William. 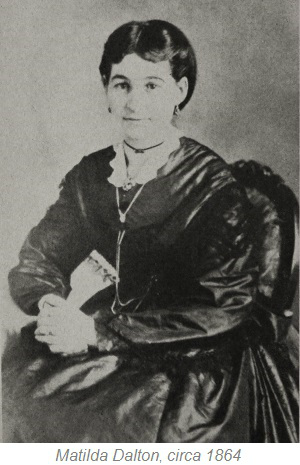 William Dalton mentioned to Clara and Matilda Dalton at dinner that night that he was puzzled why Plummer denied knowing him because he and his parents and sisters lived near them for eight years in Wisconsin. Later it was learned that Plummer had murdered a man in California several years earlier, and was hiding and running from his past. For more information on the "Innocents" and the Montana Vigilantes, CLICK HERE. 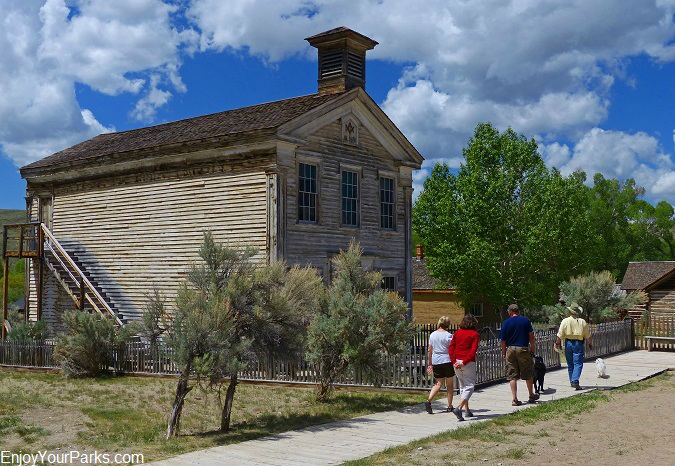 The Bannack State Park, located east of Dillon Montana, has a staffed visitor center as well as guided tours. 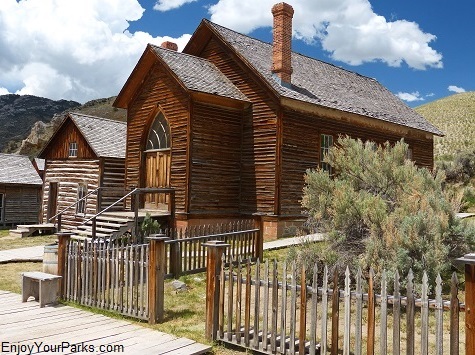 There is also a campground located in the Bannack State Park along the famous Grasshopper Creek, where campers might hear the ghosts of prospectors panning for gold during Montana's first gold rush. 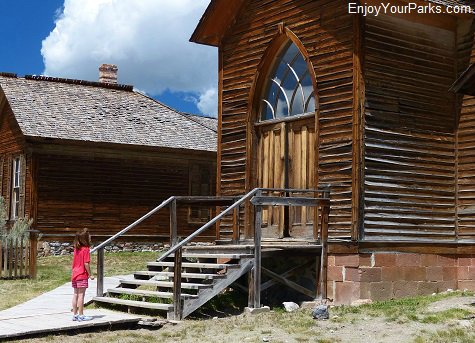 Bannack State Park is an extremely popular destination for visitors exploring Montana.